EA today announced EA Access, an upcoming subscription service for the Xbox One that will feature free games, early trials and discounts on digital purchases. EA Access members will get a chance to try out new games, such as Madden NFL 15, NHL 15, FIFA 15, NBA Live 15 and Dragon Age: Inquisition, five days before their release. You’ll still need to buy those games once it comes out, but your progress will carry over if you do so. 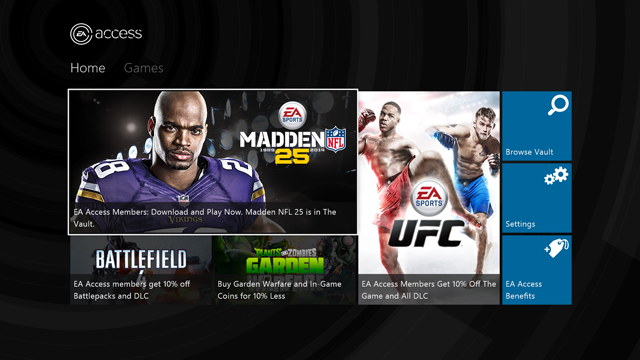 Digital purchases of games and DLC will cost 10 percent less for members when purchased through the Xbox Games Store. You’ll find more information about EA Access on the official website when it goes live. I’m curious to see which other titles get added to the free section, but at $29.99 a year, the service seems like a good deal. Are you planning on subscribing? Let us know in the comments section below.